We prepared BaFe(1-x)-0.01Al0.01TaxO3-δ (BFATx) thick films with x between 0.1 and 0.4 at room temperature using the aerosol deposition method and we measured Seebeck coefficients and conductivities between 600 and 800 °C at different oxygen concentrations. 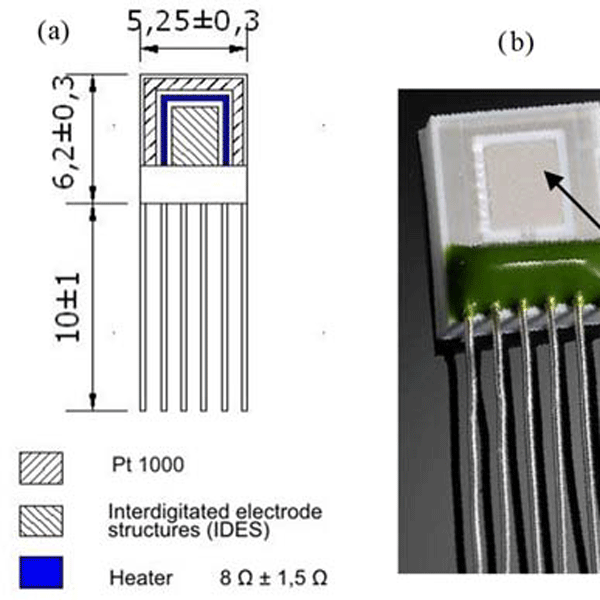 Deposited on a transducer that includes a heater, equipotential layers, and electrode structures, a dual thermoelectric–resistive oxygen sensor with almost temperature-independent characteristics of both measurands was realized using BFAT30. A planar thermoelectric gas sensor is modeled. By coupling all influences (fluid flow, gas diffusion, heat transfer, chemical reactions, and electrical properties) a model was set up that mirrors the sensor behavior precisely, as the comparison with experimental data shows. The coupling of 3-D and 1-D geometry enables to calculate the temperature distribution, fluid flow, and the gas concentration distribution in the 3-D model, while the chemical reactions are very accurately calculated in 1-D.
An FEM model is used to improve the sensor design of a Tian–Calvet calorimeter. By modifying the basic part of the sensor (a sensor disc based on low temperature co-fired ceramics), the sensitivity was increased by a factor of 3. The model was validated and the sensors were calibrated. Indium and tin samples were measured. The melting temperatures show a deviation of 0.2 K while the enthalpy was measured with a precision better than 1 %. The values for tin deviate by less than 2 % from literature. Initial steps to apply a new ceramic multi-layer sensor for a Tian–Calvet calorimeter are shown. The FEM-developed sensor consists of stacked ceramic discs and insulation rings. The functionality of the sensor disc was proven up to 600 °C and the entire stack was tested at room temperature. The resolution was 5 µW and the sensitivity was 8.5 µV mW−1. The new sensor shows similar specifications as commercial devices and presents a good starting point for future high temperature applications. Thimble-type lambda probes that are known for their robustness in harsh exhausts can also be used as an NOx sensor by applying the pulsed polarization technique. This study evaluates in detail the influence of temperature on the NO sensitivity, so that an optimum operating point can be derived. Stepwise NO concentration changes between 0 and 12.5 ppm in synthetic exhausts demonstrate the high potential of this concept. Is it possible to detect in situ the sulfur loading of a fixed bed catalysts with a sensor? A concept to measure in situ sulfidation of silica pellet catalysts loaded with nickel is evaluated. During sulfidation between 100 and 400°C nickel sulfides form. The electrical impedance of the pellets was recorded in situ. At first, the particles are highly insulating but during sulfidation their conductivity increases by decades. Since nickel sulfides are less conductive than nickel, the strong conductivity increase may be due to conducting percolation paths that form during sulfidation. Cadmium is one of heavy metals that can cause serious health complications if humans are excessively exposed. This research was conducted to detect the amount of cadmium inside herbal plants using a new sensor modified with graphene and ionic liquid. The amount of cadmium inside herbs A, D, M and C were 0.0035, 0.0237, 0.0267 and 0.0251 milligrams/litre, respectively. The results showed that the herbs were safe to be consumed. The developed sensor was comparable to existing detection methods. A novel method for the detection of short pulses of gas at very low concentrations is presented. Applying the method to a doped SnO2 detector, gas pulses down to a dosage of 1 ppb times seconds can be detected. The gas transport inside the detector is simulated using the finite element method (FEM) to optimize the gas transport and to keep response and recovery time as short as possible. With this approach, we have demonstrated a detection limit for ethanol below 47 fg. 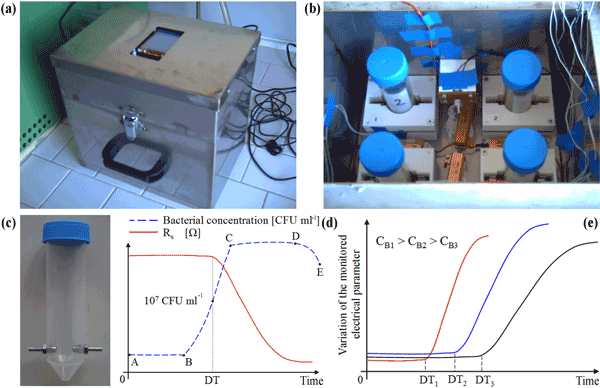 The paper presents a portable sensor system that measures the bacterial concentration in metalworking fluids (MWFs) exploiting impedance microbiology. Good agreement has been found between the system response and that of the reference plate count technique (PCT). The proposed system allows automated bacterial concentration measurements with shorter response times than the PCT (4 to 24 h vs. 24 to 72 h) and is suitable for in-the-field MWF monitoring. Some results of the solid-state hydrogen peroxide vapor sensors made from semiconductor doped metal oxide nanostructured films have been presented during the international conference in Nuremberg. In this paper the extended version of our investigations of the detectors of hydrogen peroxide vapors are presented. The prepared sensors exhibit a response to very low concentration of hydrogen peroxide vapors. These detectors can be used in medicine, pharmacology, food and the textile industry. 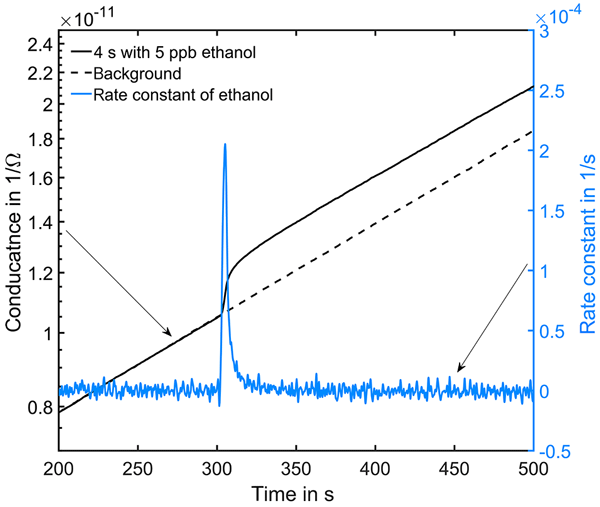 We describe a low-cost sensor for the detection of ethanol in alcoholic beverages. 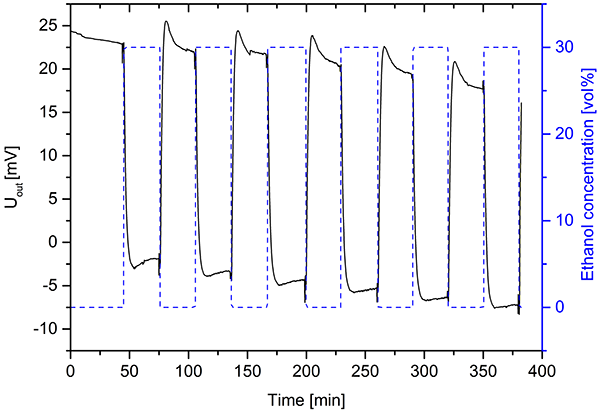 The reversible swelling of alcohol-sensitive hydrogels depends on the ethanol concentration. The resulting swelling pressure was detected via piezoresistive sensors. We have tested the swelling properties of the hydrogel (e.g. swelling kinetics, selectivity to other alcohols). Furthermore, the first sensor set-ups were tested and the reversibility of the hydrogel-based piezoresistive sensor was demonstrated. The paper reviews the principles and applications of high-resolution ultrasonic spectroscopy in real-time, non-destructive analysis of molecular transformations, including transitions in polymers, ligand binding, self-assembly, crystallisation, gelation, phase diagrams, monitoring of chemical and biochemical reactions. High precision and useful capabilities of this technique enable its application in a broad range of systems, where other methods often fail or have high analytical cost. A systematic investigation of a split-ring resonator for application as a biosensor is presented. The parameters responsible for the sensitivity of the setup were determined using a new approach to determine the resonance frequency depending on the relative permittivity of the sample. Based on these parameters, the resonator structure was optimized. Subsequently, a split-ring resonator was functionalized with aptamers and a selective detection of CRP could be shown. In this paper, we have investigated ruthenated MWCNTs/SnO2 thick-film nanocomposite sensors in the presence of propylene glycol (PG), dimethylformamide (DMF) and formaldehyde (FA) vapors in the air. The minimal PG, DMF and FA gas concentrations at which the perceptible signal is registered are 13, 5 and 115 ppm, respectively. The optimal results are shown at 200 °C operating temperature. Dependence of the response on gas concentration is linear in all cases. Electron capture detectors (ECDs) are widely used for the detection of electron affine substances such as pesticides or chlorofluorocarbons. In this work we present a new non-radioactive ECD and investigate the analytical performance depending on the operating parameters. We achieved limits of detection for 1,1,2-trichloroethane and sevoflurane, which are comparable to radioactive ECDs. Furthermore, a pulsed collector voltage mode was implemented, leading to an extended linear range. Electrical impedance spectroscopy, in which a sine-wave test voltage or current is applied to the sample under test to measure its impedance over a suitable frequency range, is a powerful technique to investigate the electrical properties of a large variety of materials. This paper presents an updated review of EIS main applications such as measure of bacterial concentration, analysis of human body composition and characterization of food products, as well as other non-biological applications. Carbon dioxide is a main greenhouse gas and a gas that well-represents air quality. Therefore, it is important to monitor the CO2 concentration in air. Creating an affordable and reliable CO2 sensor is the purpose of this paper. Using a mass-sensitive acoustic sensor (FBAR) we can detect increasing CO2 concentration by a mass increase on the sensor surface. As humidity changes often interfere with these signals the selection of CO2 over humidity changes is another topic addressed in this paper. We have developed a preparation technique to form graphite/TiO2/Ti and platinum-graphite/TiO2/Ti solid-state sensors based on plasma electrolytic oxidation (PEO) of titanium foils, whereby a porous titanium oxide layer is formed with well-defined phase composition and a reproducible microstructure. A printing method is used to deposit graphite or catalytically active graphite-platinum electrodes. Our design enables the application of many different detection principles such as calorimetry. 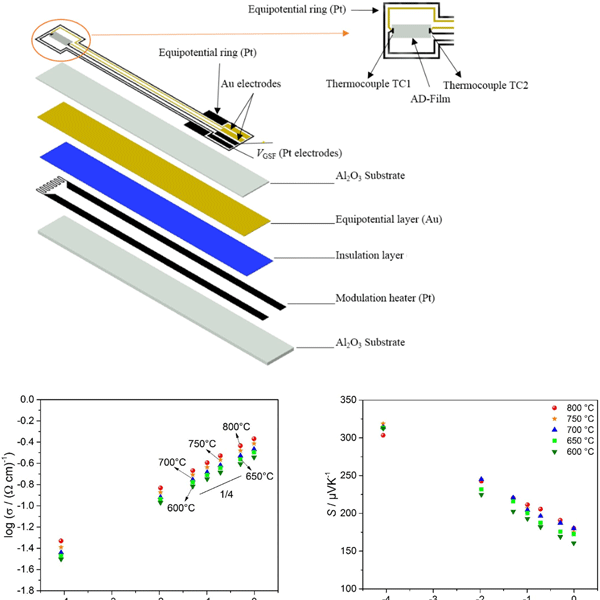 For the application of indoor air quality monitoring, two types of tungsten oxide gas sensor layers were prepared via pulsed laser deposition. Analysis of the structure of the produced layers showed that they consist of nanoparticles and agglomerates of nanoparticles. The sensors showed significant sensitivity and selectivity towards naphthalene in the ppb concentration range. The results were achieved using temperature cycled operation of the sensors and pattern recognition signal treatment. The article reports about the development of novel microfluidic sensors that are directly attachable on 3-D polymers. An ability to integrate electrical and fluidic parts into the 3-D platform brings the sensors to a new level of miniaturization. The sensor system is made of a flexible polymer featuring a system of metal electrodes and a rigid polymer carrier with all external macroconnections. To the concentration of ethanol in DI water the sensor system showed the desired sensitivity. Hydrogels are swellable polymers, which exhibit superior sensor properties. However, the exploitation of these properties for innovative measurement technology has been prevented by the lack of a manufacturing technique for thin hydogel films that suits industrial needs. We suggest a paradigm change from the current recipe-driven sensor manufacturing to a specification-driven one. Our contributions are optimized processes for a controllable film formation and thermal curing of the hydrogels. The current contribution reports on the substrate influence in multilayer metal-oxide chemical sensors. Measurements of the impedance are used to discuss the sensor performance with quartz substrates, (laboratory) glass substrates and substrates covered by silicon-dioxide insulating layers. Numerical experiments based on previous measurement results show that inexpensive glass substrates contribute up to 97% to the overall sensor responses. 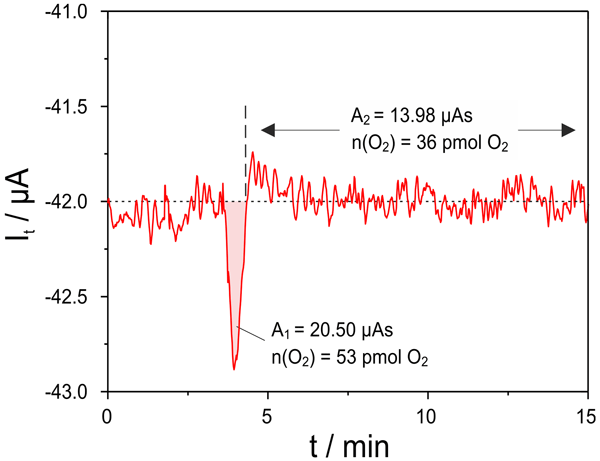 A time-monitoring oxygen sensor based on a diffusion-controlled oxygen reaction of the indicator system methylene blue (MB)/leuco methylene blue (LMB) and riboflavin was embedded in a water-loaded poly(vinyl alcohol) (PVA) matrix. It can be used in packaging, sensors, and biotechnology applications. Since the oxygen diffusion coefficient in the PVA matrix strongly depends on temperature and humidity, two different approaches were developed within this work to compensate for these two effects. We present the development of a simple and fast method for restoring exhaust graphene-based chemi-resistors used for NO2 detection. Exposing the devices repeatedly to gases or to air for more than two days, an overall worsening of the sensing signal is observed. Starting from this hypothesis and from the observation that nitrogen dioxide is soluble in water, we performed a recovery method consisting in the dipping of exhaust devices into ultrapure water at 100°C for 60 sec.